The birds are chirping, the temperatures are starting to heat up and brands of all kinds were pranking consumers at the beginning of this month, which can only mean one thing: it’s April. It’s also time to look back at what was another big month for digital marketing news. From Google killing off some of its markup in the SEO world, to social platforms streamlining the ecommerce checkout process, there were some pretty big stories this past March. Let’s get into them. Retailers looking to step up their ecommerce game through social media just got some help from two major platforms. Instagram and Pinterest introduced new ways to connect with users interested in making an immediate and barrier-free purchase based on posts and ads. First, there’s the “Checkout” feature on Instagram, which is currently in a closed beta for specific companies and only in the U.S. The way it works is quite simple, as it allows users to go through the entire ordering process for a product without leaving the app. There are even more new shopping features on Pinterest, where the concept of “pin to purchase” has been expanding for a few years now. Shopping Ads are now available to all brands who want to more easily promote their products, while the “Shop a Brand” feature is being rolled out to let users see more from a brand directly from product pins. Those are just two of the latest updates from Pinterest, so check out their blog if you want to know more. Just as the company has done in the past, Google shared the latest annual figures of just how many bad advertisements were removed from what’s referred to as the “digital advertising ecosystem.” And just as previous numbers were also significant, 2018 was no different as an apparent 2.3 billion ads were removed for safety reasons. There’s more to read about this if you’re interested, including a story about how Google worked with the FBI to take down a major fraud operation. Check it out at the company’s blog. When the user sees a shoppable ad—indicated by the “sponsored” text and price tags—they’ll be able to hover over the items for sale in the image. Google is only testing this with a small percentage of traffic with select retailers, but the plan is to introduce the ads across more product types and categories in the coming months. Google has also brought its Showcase Shoppings ads to Image search results to provide “ a more inspirational and rich visual experience” for users. For example, those searching for queries like “makeup,” may be served ads from a beauty company. If you’re interested in learning more about these new ad formats, head to Google’s blog. Basically, this means that all auctions for an impression will take place at the same level, at the same time. This should lead to more transparency in the bidding process and even quicker actions. 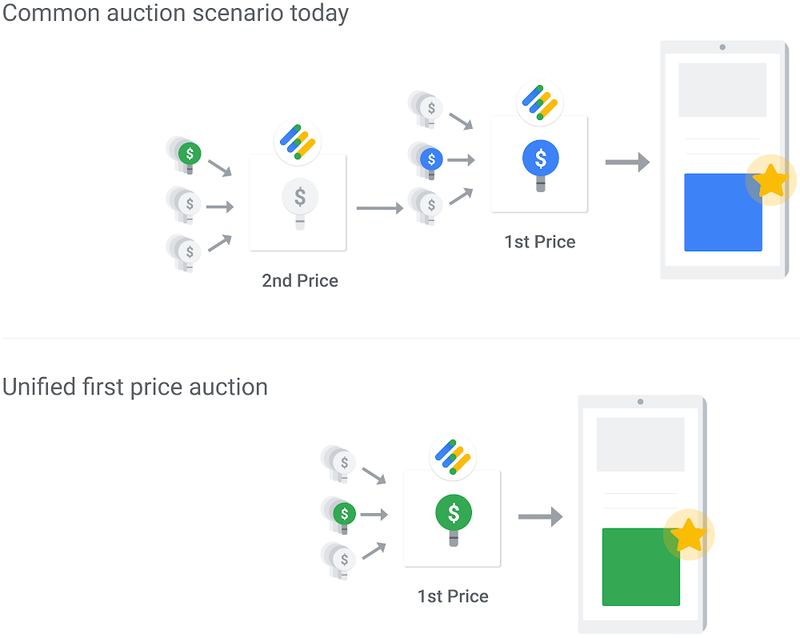 As noted, this eventual move—expected to be completed by the end of 2019—to a first price auction process will only impact display and video ads sold through Ad Manager. So if you’re dealing with auctions in Google Search, DV360, YouTube, or other company properties, these changes won’t affect you. There’s a new way for business owners to gain some attention in the SERPs when using Google My Business. The platform now provides users with the opportunity to create up to 10 offers to display in their listing. The space provided in the listing can include a description of the offer, a coupon code (if applicable) or any other relevant information for the reader. As noted, users can create up to 10 completely unique offers, all of which can be placed into your business listing’s carousel. They also feature their own unique settings, including imagery, text and the length of time you’d like them to run. You can learn more about how this all works and how you can set up some of your own offers at Google’s blog. Once again, the Google Webmasters Forum has found a new digital home and now resides here. But that’s not the interesting news item here. The platform has changed to now be read-only, which means that users aren’t allowed to post questions anymore. You can still go on the forum and interact with posts and other users through upvoting and publishing replies (as long as the thread isn’t closed). However, they have taken away the ability to post new questions or threads in the same location. To start a discussion now, you’ll need to visit this new section to pose your question (and hopefully get the answer you’re looking for). Another month, another update to Google Search Console. This time, Google rolled out four changes to the Sitemaps report as a way to make it easier for the user to perform specific actions. When using GSC, you can now open the sitemap content in a new tab, delete sitemaps, review the granular details for sitemaps that have errors, and present RSS and Atom feed sitemaps. It’s worth noting that if you previously wanted to delete a sitemap, you had to go into the classic version of Search Console to do it. This change (and the others) means you can obviously streamline your process, and it hopefully means that Google will bring all the beloved features of the classic GSC to the new one. No official statement was made as to exactly why the markup was retired, though Google’s own John Mueller did tweet that “it hasn’t been used for a while.” So what exactly does that mean if your site contains the markup? Good question, and it’s one that Ryan thoroughly outlined in his article on the Ayima blog. Spoiler: you probably don’t need to worry about it. Also, we may only be in April, but be sure to mark your calendars for 14th May to watch this year’s Google Marketing Live broadcast. Just as we did last year, we will cover the biggest topics covered in the event, so keep an eye out for that, too.